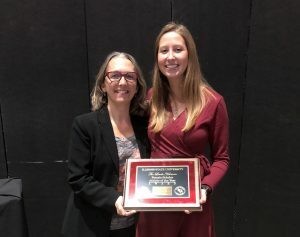 LAN is proud to announce that senior Spanish teacher education major and French minor Kiley Walsh was named Female Scholar-Athlete of the year at this year’s Reggie awards ceremony. Kiley is a member of Illinois State’s women’s golf team and was also awarded the prestigious Robert G. Bone scholarship in 2017-2018. Kiley studied abroad in Granada, Spain and is currently student teaching.